I really want to do some food exploration, but am concerned about eating fresh veggies and fruit. What are your thoughts on the matter? It wasn't the first such email I've received. The food-focused traveler's conventional wisdom says: if it's not hot and cooked don't eat it, unless it's a fruit or vegetable with a peel you can remove yourself. We flout that rule wherever we go. Fresh tropical fruits, peeled and cut into bite-sized pieces and sold from a cart are one of Southeast Asia's manyedible pleasures, as are blender drinks made with fresh fruit and ice. 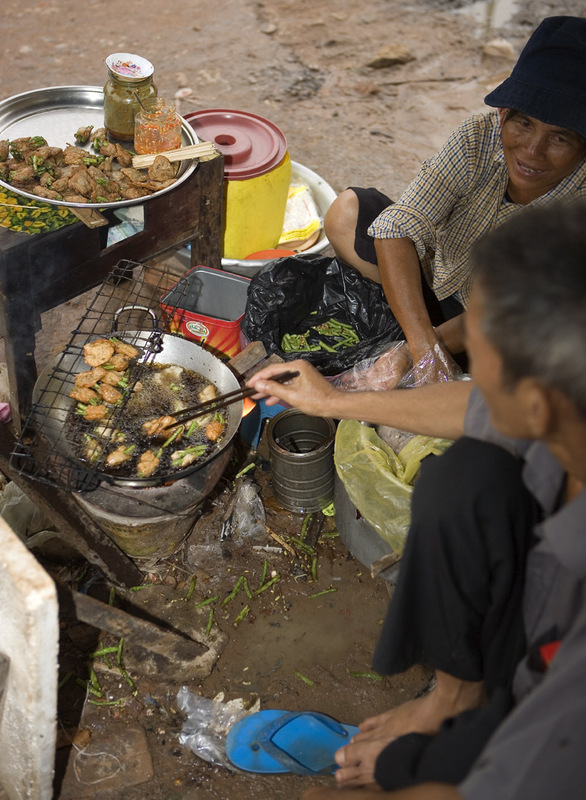 If you're eating in Vietnam, Laos, Cambodia, or Thailand, staying away from fresh veggies means denying yourself a key component of the local cuisine. Room-temperature curries and other not-ot cooked foods eaten with rice are par for the course. Do we get sick from street food? Not often at all, considering the amount of grazing we do. Is that because we've built up 'immunities' in our years in Asia? I tend to doubt it. We're both in excellent shape (according to the results of recent physicals) and try to stay that way when we travel, and I think that gives us a leg up to begin with (we've also had the requisite vaccinations). On the rare occasion that we do get sick from food there's no pattern to it, no easily identifiable source. And when one of us gets sick the other never does, even though we eat from the same plates (even if we're not sharing he tastes mine, I taste his). To me this indicates that getting ill from street food often comes down to the luck of the draw. All it takes is one little speck of nasty matter, which might originate in the food you're eating or with the vendor who dishes it up. 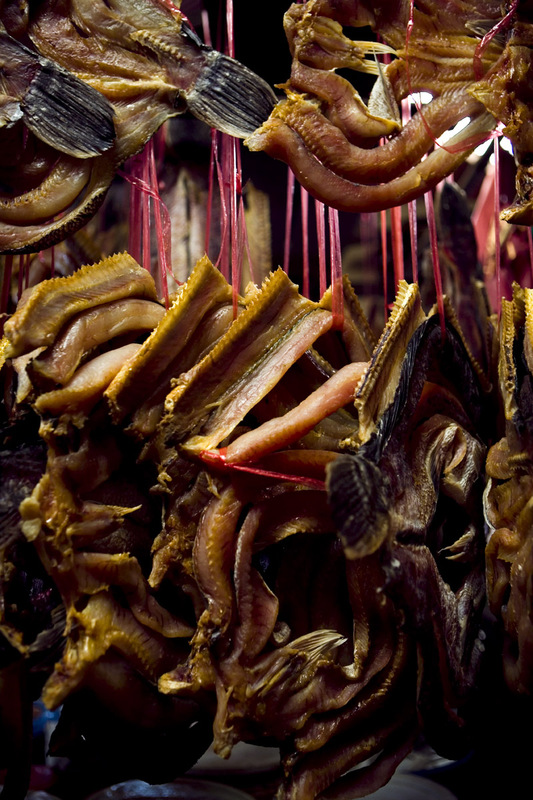 It might be lurking on the plate it's served on or the chopsticks or silverware you eat with. Or, it might just float in on a breeze and settle on your spoon right before it enters your mouth. A crap shoot, in other words. Which is not to say practicing some common sense doesn't increase the odds of staying healthy. 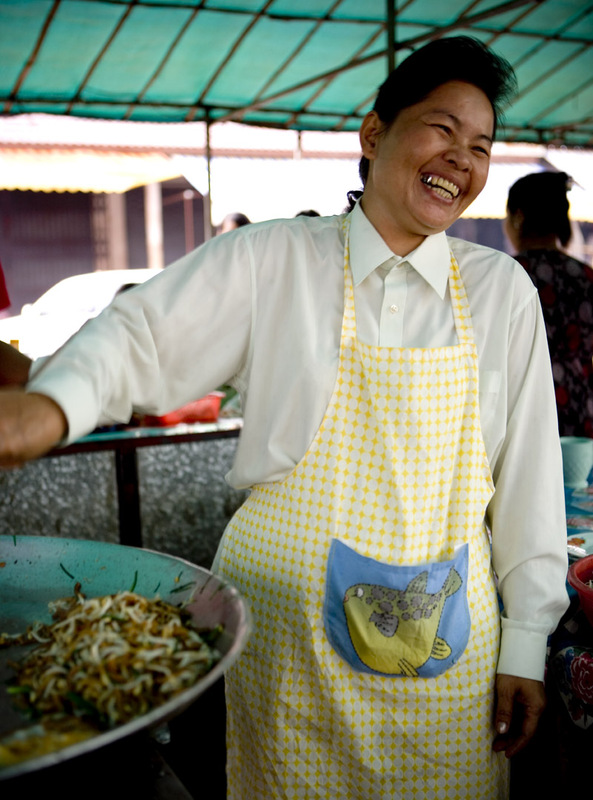 We look for crowds - locals get sick too, after all - and for vendors who strive to keep their tables clean and shoo away flies. We avoid the last dregs of anything (if something's obviously been sitting around for hours and hours, why tempt fate?) and try to do the same with hideously dirty surroundings. Try. That's the operative word. After arriving in Siem Reap we headed straight for Psar Loeu, a big and, yes, awfully dirty wet market about 10-15 minutes by tuk-tuk from the center of town, in search of something to eat. Soaking rains had left its surrounding lanes a sea of mud. It was 3pm and the row of rickety food stalls out front were open but quiet, flies buzzing unimpeded around the ingredients on display. 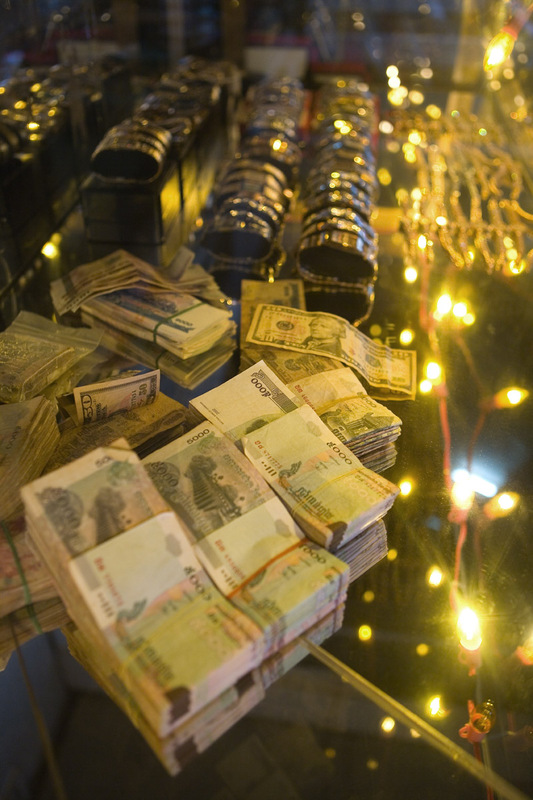 We went inside, where the only stalls still open were those dealing in gold, currency exchange, and dried meats and fish. 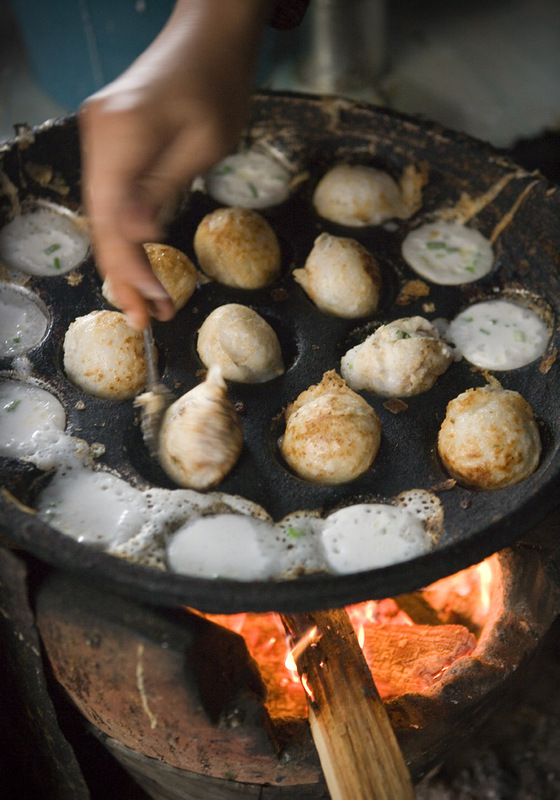 And exited at the rear, where we ran into a group of women cooking a kanom krok-alike coconut and rice flour treat. Next to their table, a pile of reeking refuse - one of the market's binless 'dumpster' areas. It was mostly vegetal matter, but it stank to high heaven. The dishes looked dodgy.The ladies were serving their specialty with bowls of coconut milk seasoned with prahok, so getting a bag to go was out of the question. Dave and I looked at each other: 'Should we?' we asked each other, a couple of times, as we'd done in similar situations countless times before. The answer is always the same. I'd like to say that we perform some sort of logical calculus, carefully weighing pros and cons, risks versus rewards. But this is how it goes: here is an appetizing, unfamiliar food. Or a familiar food served in an unfamiliar way. 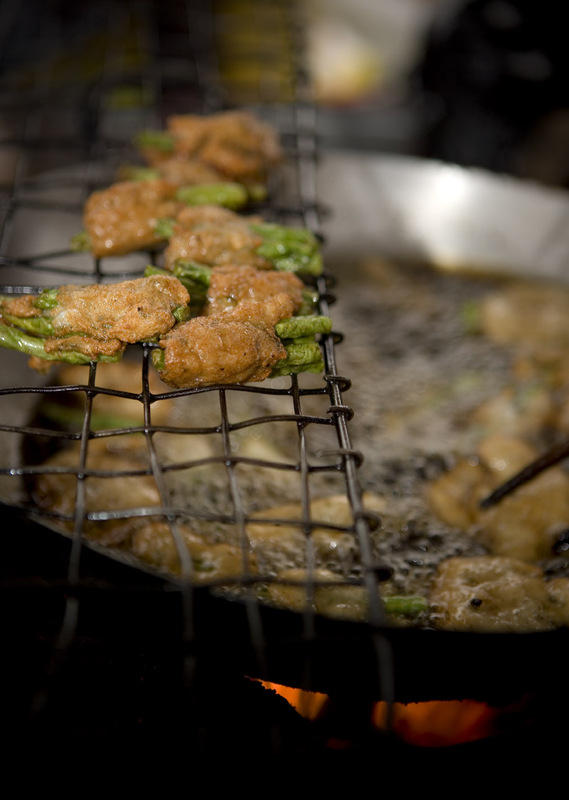 A street food we might not see again. How could we not? So we did. 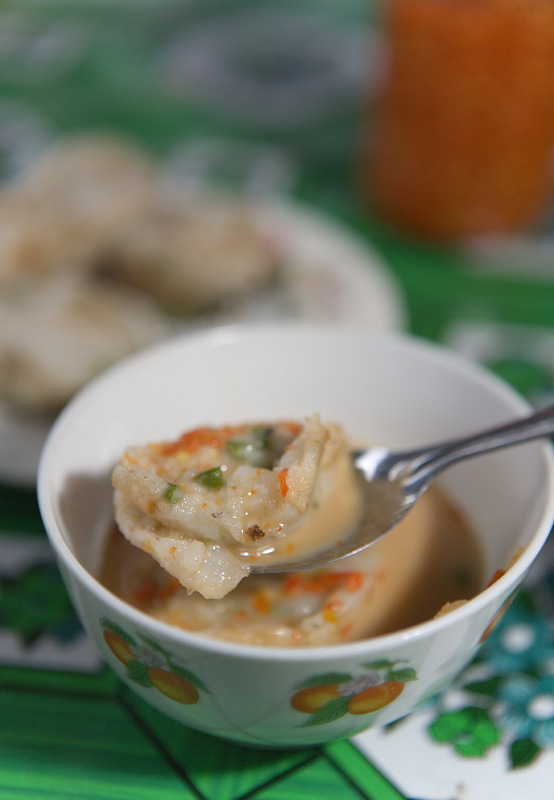 It's an inspired combo, coconut milk and prahok (the Cambodian equivalent of bplaa raa, Thai super fermented fish sauce), rich sweetness playing off salty fishiness. 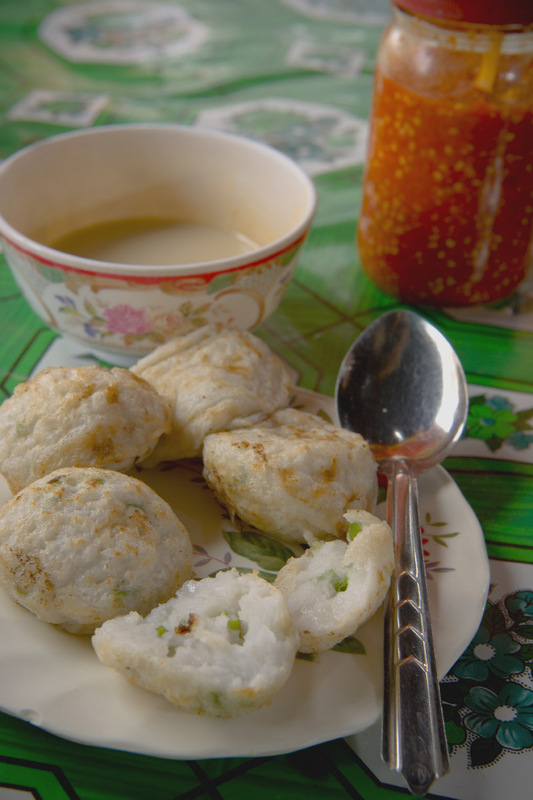 A spoonful of garlic-laden chili sauce from the jar on the table jazzes things up a bit, and the lot is a fine accompaniment to the crispy-outside, chewy within coconut milk-rice flour balls. Unfortunately, as I discovered when I put one in my mouth, ours were cold - the vendor had chosen them from an old batch instead of taking them off the griddle. (I take full responsibility for inattentiveness. I know better.) Risky, perhaps, but the thing was already in my mouth, and scrumptious. Emboldened - because that's how it works for us; once we've breached that Should I?-Shouldn't I? barrier we figure well, what the heck, if we're gonna get sick later anyway we might as well eat what we can before it happens - we munched our way through Psar Loeu's late-afternoon offerings, mud squelching into our sandals as we walked (that's what showers are for). There were thin crepes rolled around coconut-scented sticky rice into tubes the size of our forefingers, slices of fresh mango bagged in plastic, and the tastiest green papaya salad we've ever eaten. By the time we'd traced a path back to the front of the market the previously sleepy stalls were hopping. We stopped in front of a crowded table where, on our way in, Dave had eyed a platter of what looked like snow-white earthworms. A few minutes later we were diving into a mound of fantastically chewy rice noodles char-fried with heaps of Chinese chives and bean sprouts and served with a Chinese chive-stuffed fried rice dumpling (deep-fried taro cake was also an optional accompaniment), as greasy (in a good way) as it was delicious, especially with a blob of vampire-chasing garlic-chili sauce on the side. On our way out of the market we stopped for another brilliant snack food, long beans wrapped in fish paste and deep-fried. Bagged with a splash of fish sauce, a dab of chili paste, and shredded fresh cucumber and herbs, these were reminiscent of Thai tod man bplaa (deep-fried fish cakes). The beans, shriveled from their bath in the hot oil, were intensely vegetal and the flavorful fish paste crispy and rubbery at the same time. The bottom line here? In two hours at Psar Loeu we ate five delicious street foods that we probably never would have encountered if we'd limited our eating to Siem Reap shops and restaurants (we were on the ground only 3 days this trip). Were the surroundings dirty? No doubt. But we came through with no ill effects (though we certainly can't guarantee the same for others), spied a stall that would prove the source of a wonderful dinner later that night, and returned again another morning to sample more equally worthwhile market treats. Risk has its rewards. >>Is that because we've built up 'immunities' in our years in Asia? I tend to doubt it. I'm very sorry to have to say this (I love the blog and especially Dave's new flash), but you're wrong. After years of eating dubious foods, one certainly builds up immunities. Your digestive system takes on and adapts to local nasties the longer you are in a place. It's the same mechanism at work that makes immunizations work - you are repeatedly exposed to low (or high) level doses of a nasty bacteria family, and your body adapts/creates antibodies. This is also why newborns are much more susceptible to these same pathogens - their systems are blank slates (comparatively speaking), and more open to infection (breastfeeding does pass on many of the mother's anti-bodies: this is why canned milk has been such a big problem for infant health in rural Cambodia - it has no anti-bodies). But, as you know, that doesn't keep you safe from the occasional free radical pathogen. Which could be in the cold rice cake, the badly washed spoon, the unwashed bowl or (my favorite) the moldy jar of chili paste at the "Good Food" restaurant on Suthep Road in Chiang Mai. Or it can all be clean and you can eat at Psar Leou at three in the afternoon and not get the trots. People ask me these same kinds questions over and over and over. I will send them this way in the future. Your post addresses it nicely. People who have never been to, or only briefly been to the places they tell scare stories about like to repeat the same bunk stories of what makes people sick. I had to bite my lip the other day when a group of acquaintances explained so matter of factly why people get sick in Mexico: Sometimes it's dirty ice, others it's a watered down shot of alcohol with dirty water of course, and sometimes it's dirty water cleaning their salad ("Oh, I never ate vegetables in Mexico!") What is so infuriating about these stories is that the locals there never ever drink the water nor would they ever serve it to a foreigner. They do in fact know about water borne illnesses. Furthermore, most of the people that repeat these myths often gain their wisdom in a tourist hotspot like Cancun or maybe Puerto Vallarta where tourists are catered to, not so carelessly or intentionally sickened with poor hygeine. They never think to blame their own overconsumption of food and alcohol while on vacation. When I went to China I had the same fears and heard the same warnings. But like you I quickly decided that if everyone was enjoying something, why should I miss the fun? I ate everything, everywhere, and never got any kind of food poisoning in three years. I may have had some immunity by the end, but certainly not at the beginning. I wish we had such a great variety of street food here to enjoy. Your snacks look delicious. Hi Jerry - Whoa there - I didn't say I don't think we've built up immunities. I'll certainly buy that. My point was that I don't think they are the main reason we don't often get sick. I mean, how then to explain moving to China in the mid-80s at the tender age of 21 (never having been outside of the US), eating everything, and never getting sick, not even at the beginning? Or moving to Bangkok after 4 yrs in the US, doing the same right off the plane for a year, and never so much as a bit of queasiness, from Day 1? Or supposedly having built up the same immunities (since we're eating the same thing), and one of us getting sick from a plate of X while the other has narry a problem? There's got to be a lot more at work than immunities here. And if non-immune travelers believed it was mostly immunities then they'd never give it a shot. a - rants allowed here. I've done my share of ranting. Kitt - it's really a personal choice in the end. I usually come down on the side of 'the risk is worth it'. Very well put and true for the entire globe, not just South East Asia. I remember in 1997, when my (now ex-) wife and I made our first trip to Mainland China together. Our first stop was Guilin. We were determined that we were not going to waste a trip to the heart of China by eating hotel food. We asked our tour guide where the food market was; she pointed it out but told us not to eat there because it wasn't "clean." That night we walked around town. If there were any non-hotel restaurants there, we couldn't find them. Finally we got to the market, which was packed with people. We looked at each other and simultaneously said, "those people look healthy enough!" And so we went in, found a friendly vendor, and enjoyed our first meal in China sitting outside on a beautiful evening, surrounded by friendly people. And neither of us got sick. I did get sick several days later after having dinner at the famous Quanjude restaurant in Beijing. Go know. Guys, shhhhh! Don't dispel those rumours that tourists love to tell, like if you leave the hotel and eat in a market you will probably die. Let them eat their rubbish, and leave the wet markets for me! I never get sick precisely because I eat street food and local food. The reason being,they know how to prepare it so people don't get sick. It's the inexperienced people working in 'western' restaurants that don't understand the ingredients and techniques and refrigeration, holding temperatures, handling ect ect. to make the food safe. Thanks for stopping by the Silk Road Gourmet. I've returned the favor, found that I love your site and will link to it. The last post was wonderful - showing the rewards of eating outside the box. That has often been a problem for me/us because of our minder's insistence that we not stray off the beaten path. I've literally snuck out of my hotel or guest house by going over the balcony and down the outside of the building to get out for an unsupervised crawl through the night markets of Asia. The interesting thing that is inherent in the posts but not said outright is that the markets are probably getting cleaner than they were - say a decade or two ago - and the vendors more attentive to hygiene issues that spread disease - like handwashing. As you pointed out - the Cambodians, Malays etc can get ill too and sometimes do. Getting people sick is bad for business - and the locals form the base of support for these markets far more than the occasional tourist. To some degree it is a roll of dice, and, to some degree it is using common sense. So, you can load the dice in your favor. In my years of traveling to Cambodia I've not been hit with the "revenge" yet. But, I always carry a strong antibiotic with me - and that is not a roll of the dice - there will be the day I will need it. Until then - happy grazzing! You've found why I rarely pipe up in the Interblogosphere - my "voice" comes off much more shrill than it appears to me when I write. You know I love you guys! Which makes a lovely story, but it doesn't really explain why some people get sick when others don't while traveling. It boils down to pathogen vectors, your body's basic immune system (white blood cells, stomach health, etc) and your immune system's "database" of previous infections it has fought off. Together, these make some people much better at fighting off illness than others, so a person can't really know how their system will react until they travel to a new place. But for many - if not most - people, science does indicate an increased chance of digestive distress when traveling from a life of corn in Iowa to cold grub in Psar Leou, or Bangkok, or Acapulco. Hmm. I do go on, don't I? None of my four children, hubby and I got sick the whole month long we were in Malaysia and we ate every thing from street food, local restaurants, relative's food and weddings party food. One of my child has never been to Malaysia. We were concern and careful all the time. I think sometimes it is the portion that is to blame. Some of our rules, don't eat too much and if the place is obviously too dirty. Wow, you've really inspired me with this one! I'm a pretty adventurous eater, and usually have no problems eating off the street. Like you, I try to use common sense, go where the locals go, and avoid very dirty settings. In that respect, Cambodia was a challenge. I went to a market in Siem Reap that was several kilometers from the center, on the highway toward Phnom Penh- don't know if it was the same one you went to, I didn't catch the name- in search of more local eats. It was crowded, and they certainly had some yummy looking things. But it was also filthy, and for once, my courage failed me. Ironically, I may have decided to pass precisely because I liked Cambodia so much I knew I'd be going back and could try those foods on future trips. Now you've given me the resolve to be braver on my next trip. Epilogue: a few days later I was walking around Phnom Penh, and smelled some mighty fine looking grilled sausages served with papaya salad. Again, the setting was filthy. But my hotel, and a clean bathroom, were five minutes away. So I risked it. It was delicious, and I was fine! Go figure. I echo Sunny's comments...most important aspect of "food experimentation" is definitely knowing where the closest and acceptable bathroom is. I love Penang rojak, which unfortunately does not love me, so back to the hotel with a bag of that sticky black pungent fruit salad and "wait out the consequences". So totally worth it! My kids have travelled with us since age 6 mths and wherever we go, they always have a slight adjustment to make to the change in fresh milk(no powdered milk). Sometimes we use UHT, but same problem. Another of life's mysteries.. I'm surprised at the number of comments this post has generated. Spike - markets are just a great place to eat. And I think that we ate in the very market you're describing, in 1997 (Xmas) not less. Skipped the bees, though. luckyfatluke - I do agree that you're often more at risk in many restaurants. Lips - I think the idea with fruits and veggies is that if you peel them yourself then you're stripping off a possibly bacteria-containing 'wrapper' to reveal an untouched (and clean and not dangerous) inside that you can eat with confidence. And that if you buy, say, peeled raw fruit the vendor's hands have been all over it so it's dangerous yadda yadda. But as I said, we don't hew to that 'rule'. And you're right, some people do have more trouble adjusting to 'new' diets. If you eat very blandly at home and then hop over to Thailand, for instance, you may need to set some time aside for the bathroom. I myself pretty much have an iron stomach when it comes to chilies. Knock on wood. Hi Laura - Thanks. Yes, minders/guides will often try to steer you away from anything too 'local'. Ah, but when you mesh with a sympatico guide it can be a wonderful thing. Dave - we always carry a couple of courses of cypro, and there have been times we've had to use it. Not too often though, thankfully. Jerry - don't we all (go on). Something weird for us is we were forever getting sick when we lived in Saigon ... never seemed to develop any immunities. But have returned twice and eaten uber adventurously with no problem. Then again, I know we are generally in much better physical shape now. So I think that must play a big part. Hmmm.. I wonder if moving from say Cambodia to a life of corn in Iowa would have the same effect as the reverse? Saida - Malaysia, IMO, is probably one of the 'safest' places to eat in Asia. We have never once gotten sick here. Rich foods - alot of coconut milk, say - can have an effect that might be mistaken for food poisoning if you're not used to them. Hi Sunny - it might have been the same market. Filthy place. Great food. As you did in Phnom Penh, you kinda gotta weigh the risks. No one wishes to waste a day or more being sick on vacation, but we would have missed so many fabulous treats if that had been uppermost in our minds everytime we ate on the street in Asia. 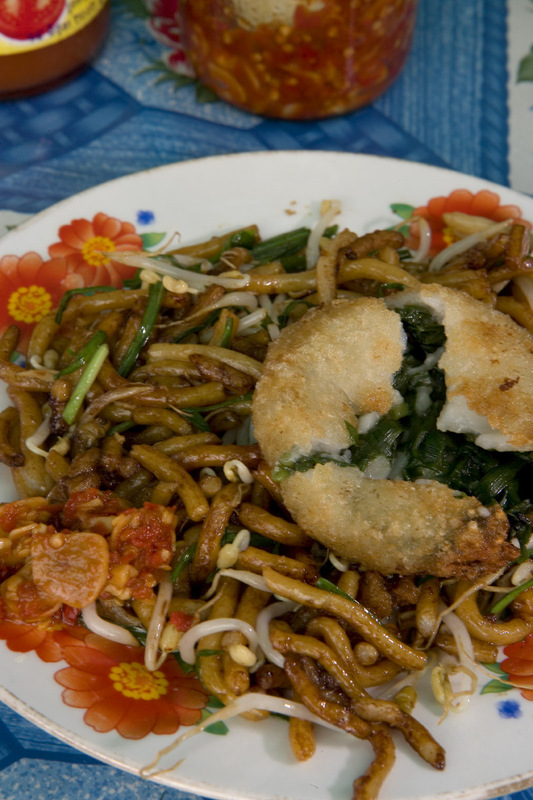 Chris - too bad about the rojak (and good on you - so many foreigners just can't take that shrimp paste. I love it, myself). Milk seems like it could definately be a problem, esp with young kids. Here's some risky eating (I think), I was hoping to get some thoughts on it. I wanted to take some prahok home to share with friends, but according to Wikipedia at least it cannot be stored raw for very long (the woman I purchased it from did not have the English and I do not have the Khmer necessary to find out from her). I would be keeping this stuff unrefrigerated for up to a week before I got home, but of course I can throw it in the fridge then. Should I take its origin (a method of preserving fish) and condition in the stall (sitting out in a plastic bucket in thirty degree heat) to mean this should be okay? Or am I better off pitching it into the Tonle Sap before I go?